Took apart the Mardi Gras Necklace I got at the yard sale yesterday. 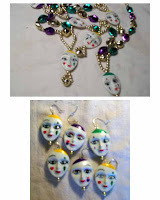 Threw out everything but 6 of the Mardi Gras faces and 6 of the small gold toned beads. (These beads are very low quality and the faces are resin).